Should you convert some of your Traditional IRA to a Roth? If you’re retired or in a low-income year, you might benefit from a partial Roth IRA conversion. This involves converting some of your traditional IRA to a Roth IRA and paying tax on this conversion amount now. The standard perspective on taking withdrawals during retirement is to take them first from taxable accounts (accounts that you have already been taxed on), then tap into retirement accounts. This allows for your retirement accounts to grow tax-deferred as long as possible. But this can create a tax problem down the road when all the taxable funds are exhausted, forcing you to take all withdrawals from your IRA. Since withdrawals from traditional IRAs are 100% taxable at ordinary income rates, you may be pushed into high tax brackets in the future. Sometimes a better strategy is to do partial IRA to Roth conversions earlier to avoid this. For example, let’s assume you need to withdraw $80,000 per year to live on, in addition to your social security and other income. If you withdraw it all from your taxable account, your taxable income might still be very low – let’s assume $20,000. Looking at 2018 federal tax tables, the 10% tax rate is applied to income up to $19,000, then a 12% rate is applied to income up to $77,400. (married filing joint).Therefore, you could convert about $57,000 of your traditional IRA to a Roth IRA and stay within the 12% tax bracket. Are you still wondering why you’d be better off paying 12% on $57,000 now, rather than paying nothing now? By paying the 12% tax now, you might avoid paying much more than 12% if you withdraw it in the future. In 2018, the next tax bracket after the 12% rate is a 22% rate! The main reason to immediately rule out a conversion is if you’re in a high tax bracket now. You’ll probably be in a lower tax bracket in the future. 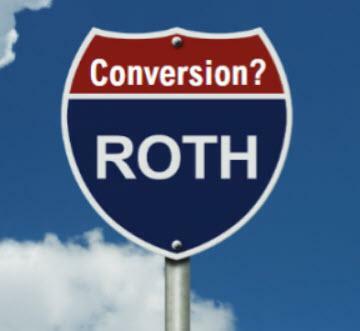 Kiplinger has a recent article that discusses Roth conversions. If you’re retired or are likely to be in a higher tack bracket in the future, contact us or your tax preparer to discuss your options.